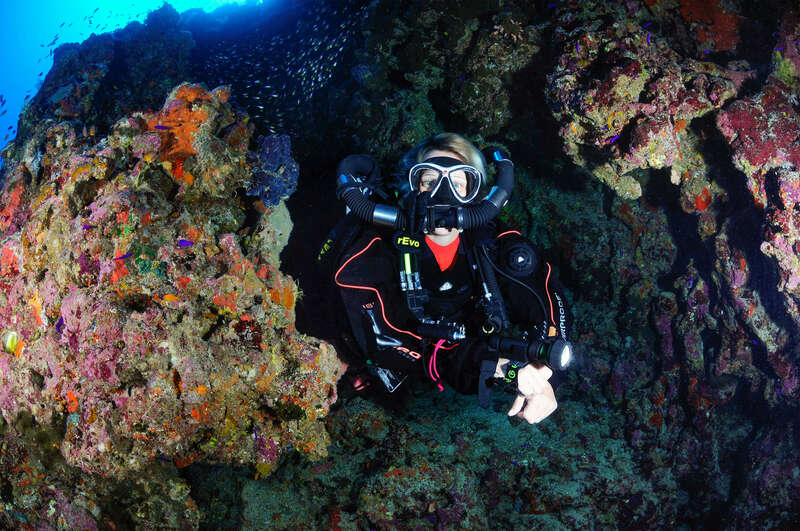 Rebreathers have opened up a whole new dimension in diving, offering the ultimate in gas-efficient “no bubbles” diving for recreational and technical divers alike. By recycling the gas that we exhale, rebreathers are super-efficient gas management tools that use a fraction of the gas used by conventional open circuit divers. This Program is designed to introduce the diver to the basic concepts of Rebreather diving, and to provide a practical confined water or OW exposure practicing various skills. This Program is designed to train Recreational divers in the safer use and technology of basic CCR diving with no decompression, up to 1.2 PO2 and to depths up to 70 fsw (21 msw). The IANTD Normoxic Trimix Diver program is designed to train divers who wish to dive to depths between 39 and 60 msw (130 and 200 fsw), but do not wish to breathe air below 39 msw (130 fsw). Trimix affords a means of managing nitrogen narcosis by reducing the equivalent Narcotic Depth (END) to a maximum of 36 msw (120 fsw). dives requiring extended decompression profiles and helium-based gas mixture. This program is designed for those individuals already involved in deep diving activities but wish to develop the skills, ability and knowledge to enable safe diving in the trimix depth range. It includes extensive dive planning workshops covering all bailout scenarios, run time management and choice of gases. The diver’s skills are developed to the highest level to promote self-sufficiency and safety whilst maintaining the ability to operate within a team.